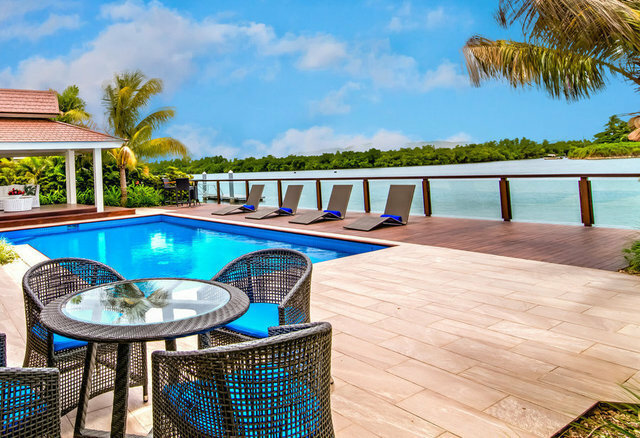 This new home on Denarau Island offers a lifestyle whether a permanent home or your exclusive tropical paradise get-away. On 1000 sq m of flat land, it is located on the river waterway where residents in this secure gated community can build a pontoon and moor their boat (up to 14 m length). The Denarau golf course is in walking distance or drive your cart. The Port Marina shopping centre is filled with a wide variety of international cuisine and all the major hotel groups are near-by on the island for dining and luxury spa treatments, shops, banks and conveniences. The climate averages 26 degrees Celsius in the winterless islands of Fiji, offering year round relaxation and activities. The home has three luxurious bedrooms, all en-suited, with two having private outdoor baths and showers in addition to the indoor bathrooms. The granite bench kitchen is complete with top appliances and wine fridge, and the expansive living area opens to the pool and garden facing the water. A Japanese garden links the main bedroom to the home providing additional privacy. Features such as the manned gates, huge loft areas in the home for extra guest, staff or storage all add to the flexibility this home offers. Make the dream a reality.